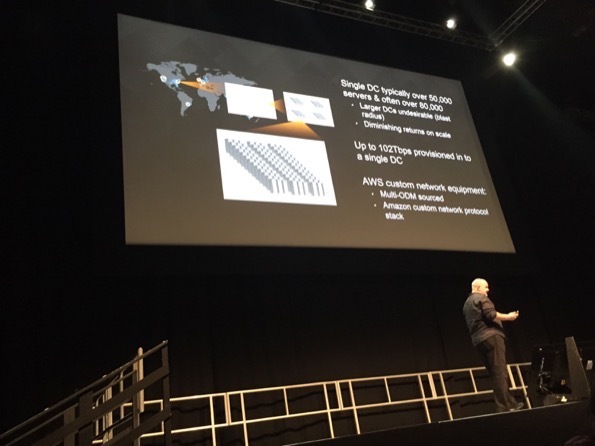 I attended the AWS Summit in London yesterday. Here are some observations in no particular order. Come for the IaaS, Stay for the PaaS. AWS made a strong case about their portfolio of software services such as AWS Lambda, Cloudformation, KMS and Cloudtrail. Its no longer just compute, storage and networking its all about the SaaS & PaaS products. This portfolio of services is expanding constantly (lots of big numbers thrown around) and I found the breadth surprising. In some way I knew about most of these products but when presented with chains of these services to produce outcomes, there is a moment of recognition when you understand what is actually happening. In corporate data centers, the decision to adopt new platforms is always preceded by endless meetings, review, gap analysis and other ITIL silliness. AWS makes it possible to “pull a sharepoint”. The reason that most Enterprises deploy Sharepoint is because a free version was supplied on Technet CDs. Eventually someone setup an old server to see if it was any good and about six months later it becomes mission critical. No ever performed ITIL-compliant process, it just crept in being freely available. Linux entered the Enterprise the same way. This is an “advanced cloud topic” that I feel many existing IT people don’t comprehend properly. 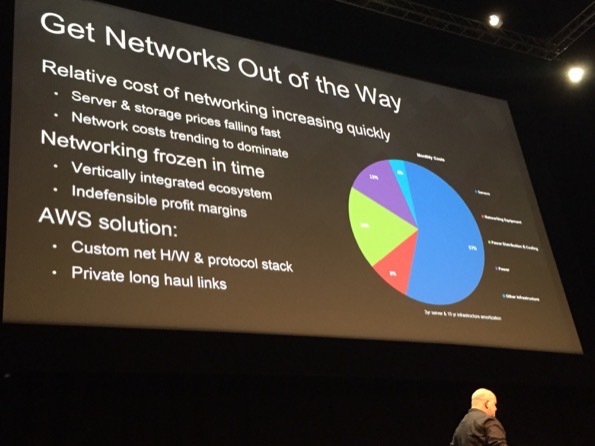 Sure, AWS IaaS is costly, limited and requires a significant effort to adopt & adapt. But once you are in the room, AWS has all of these software platforms ready to go. Want some remote desktops, billing gateway, CDN, Global DNS services ? Sure, all ready to go. More storage ? Sure, what type of storage do you want – file or object, fast or slow, archive or near line. AWS has all of that “in stock” and ready to go. No need to perform a vendor evaluation, no meetings to perform a gap analysis, no capital budgets to get allocated and compete with marketing or corporate strategist for CEO time. Just turn it on, start using. You never make a buying a decision except the first one. After that its “sharepoint deployments” every time. And most of the software is open source. You don’t have to waste time working out licensing plans, volume discounts. The open source software isn’t perfect but I can get started today, no delay, no fuss. Lets get some hurry up and get it done, lets not take time to think about things. I spoke to a small number of attendees and eyeballed badges. From what I saw, a serious number would be classed as senior executives. I can’t tell you if they are kicking the tyres, mild interest or progress but it shows that real money is interested. Thats different from other vendor conferences that are largely populated with technical types looking to be educated. Not sure if this is significant and perhaps the event was targeted at executives. As I left the venue, I spoke with 3 or 4 attendees which confirmed the view that they were developer-focussed or managerial types and were all positive about AWS. If you are looking to learn more about technology, design and structure of AWS services then I would not recommend attending. All of the sessions have the presentations published on Youtube and Slideshare. 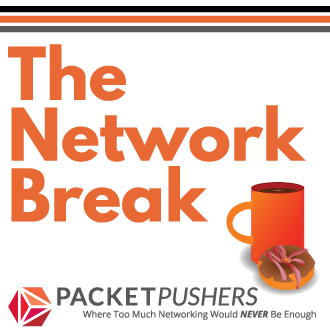 There is no reason to attend of you want to learn more about networking, security or how to use AWS services. There was an almost complete lack of banner ads on t-shirts. The conferences that I have attended is dominated by people wearing cheap chinese t-shirts with vendor banners ads (logos) prominently displayed. Aside from people manning the booths, almost no one displaying loyalty to a vendor of any sort and few booths were giving away crappy tat either. It was glorious. AWS employees are what I would call ‘true believers’ and are relentessly upbeat, spinning hard, emphasising the same messages repeatedly. The presentations were delivered by local staff which made the presentations relevant and more impactful than the usual “employee tourism” that we get. (US employees just love coming to Europe on company money). This wall-to-wall messaging makes most people distrust the content and its counter productive. Every single session had at least two AWS customers come on stage to tell their story about using AWS. They also promoted their own companies at the same time and this part got annoying by lunchtime. I came to hear about AWS and not advertisements for a dozen different companies that I have never heard of. On the other hand, some of these companies had really good stories to tell and it was powerful to see real success stories. Some executives I spoke to were extremely positive about this part and took the view that this validated or proved that AWS was ready for corporate use. The keynote had four AWS customers come on stage and talk about their “ALL IN” status with AWS. The “ALL IN” was repeated often enough to realise that a customer who makes this choice will get a lot of “AWS love”. One common theme in AWS migrations was that customers left their legacy behind, often abandoning systems and software as they went “all in”. This seems obvious but lots of people seemed to think that this was an amazing revelation. I am always wondering why it takes a migration or transition to abandon services that are no longer delivering value. Your current IT infrastructure has to support these turds, why not get rid of them now ? Why does it take a cloud migration to force easy decisions. 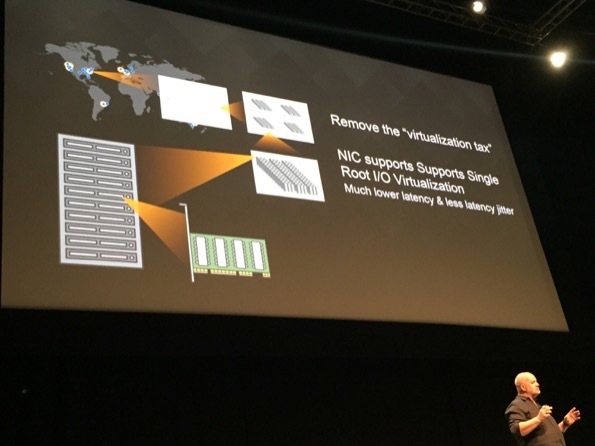 This was a session delivered by Werner Vogels, CTO for AWS called Data Centre innovation in the last session of the day. He is great speaker and has a lot more charisma than your typical vendor CEO. maximum of 80000 servers in a single data centre is the maximum blast radius of failure. multiple data centres per availability zone. 250 microseconds between data centres. <2 millisecond between AZ, usually <1 millisecond. use customer network adapters that offload the network processing using SR-IOV to reduce network jitter in the hypervisor software. custom-designed servers that optimise for power consumption. e.g. USB, audio, 240V transformers. They are not whitebox servers. 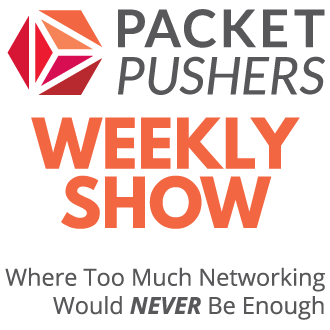 When you consider just how much capacity the network needs to support 50000 – 80000 servers per functional unit, Amazon has networking problems that are unique to their environment. Equally, Facebook & Google have similar problems have have all turned to custom hardware design at some level. AWS is working with Intel on custom processor designs for servers. For example, AWS is designing and building electrical sub-station power infrastructure because they have unique power problems due to their size. Any sort of failover switching of Megawatts is a unique condition. Any data centre burning that much power is not going to be able to use off-the-shelf power units to manage itself. 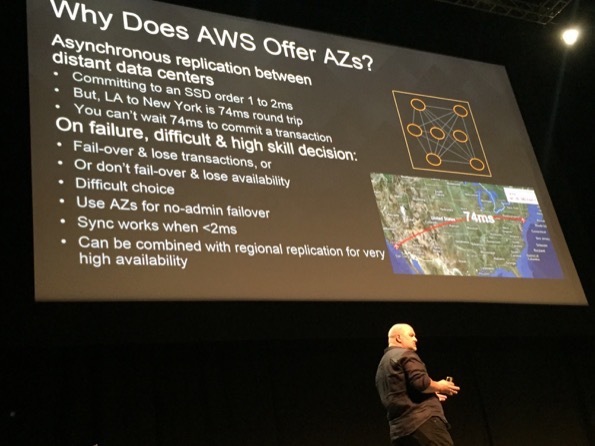 Not everything that AWS does for physical infrastructure is “better than the Enterprise”. The venue for the event was the Excel Centre at the Docklands, and this venue is simply awful. As is usual for these events, the building was too hot for comfort, access to food was very limited, many concession stands were not open. The access to break out rooms was constantly clogged. The heat meant that there was a lot smelly people which made things really unpleasant. I had to leave sessions because of the stench. Not really. It was worth attending to get a greater understanding of how Amazon AWS is coming to market and competing with the private cloud. At a business level, I found this aspect useful when working with clients, its helps with communication. As someone with a technology focus, there wasn’t much to learn from the event since it focussed on business issues and high level topics. You would be better off using the Internet reading the white papers, videos and other online content. Then you can go home on time at the end of the day.